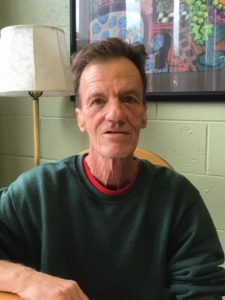 Joseph has been staying with us at Haywood Street Respite. One of the things he has been working on while here is writing thank you notes to the doctors and nurses who took care of him when he was sick. He is full of gratitude. Joseph said being in the Emergency Room at Mission Hospital reminded him of this poem he wrote one morning at AHOPE because he sees the doctors and nurses there offer care with an impressive amount of organization and kindness, which must be renewed each day. It’s ‘a new day! It’s a new day! Channel four, the stocks are on the floor! When we are in the ground? Channel five says, I’m still alive. Will the water rise again? How can I know what message to send? Push the button, mash the button. From the tree in the garden. When we get to heaven, Day New! The poem was inspired by what Joseph described as his own version of the morning news when he sleeps outside: The birds chirping.